The models are really very good. Did you make them with metaballs? Water surface looks good and the sun is very well placed. Looks quite natural. Well done. Awesome. The water on top is my favorite. Models are also extremely good. Briliant picture! I like both jellyfishes and your water! Well done! Super amazing.The water and light are incredible. The glasslike nature of the jellyfish worked well here. However, there are ways to make an object transparent without making it look like glass. I discovered this when working on plant leaves, that you need a special form of transparency. Under normal render curcumstances, anytime you set transparency to a setting above 0, something called internal reflection takes over making the object appear as glass. If you are willing, look at the MAT exchange folder on this site and download my leaf presets and alter the colors to meet your jellyfish. You will notice that I use a map for the transparency so I do not need to raise the setting above 0 and turn my jellyfish into glass. Hope this helps in the future. 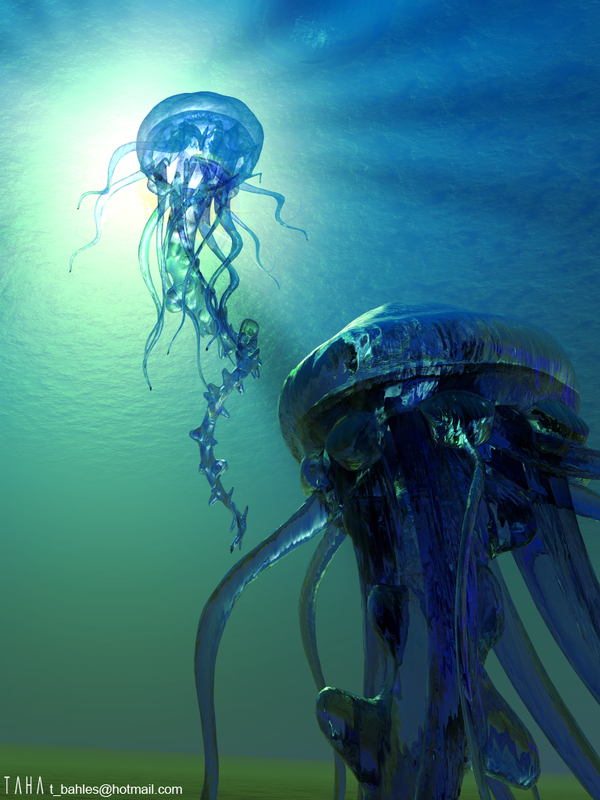 Great pic, really love the lighting and water - but jellyfish - yuk!! Those look like giant bluebottles, we get plenty of those here and if you have to sail through them with your motor going for some reason they kind of get chopped up, not very pleasant and they sting too!! LOL. The camera placement creates a great deal of interest. The sun and the resultant shadows add realism while the waters volume and surface reflection give credence to the scene. Very surreal.